When I was on teaching practice a senior leader introduced me to the concept of a lifeboat task – something to have in reserve for the times when the class in front of you finishes all the work you had planned in record time. The concept was not introduced in time to save me from a very long and desperate game of hangman with some very able Y7s who must have finished their secondary education by now. The best of these are ideas that need very little prep, and there is a super document on the TES of “minimum preparation, maximum effectiveness” tasks that did the rounds in my PGCE year and which I definitely recommend. The simplest of my lifeboat tasks is a game of noughts and crosses or connect four where each square in the grid has the initial letters of a sentence that has been worked on in the lesson, eg “HSJRGD” as a cipher for hier soir, j’ai regardé Grand Designs. Students have to guess the sentences before drawing a naught or cross for their team. But I also have a small selection of simple printed resources that have helped me out no end from time to time when the class is quicker than anticipated. 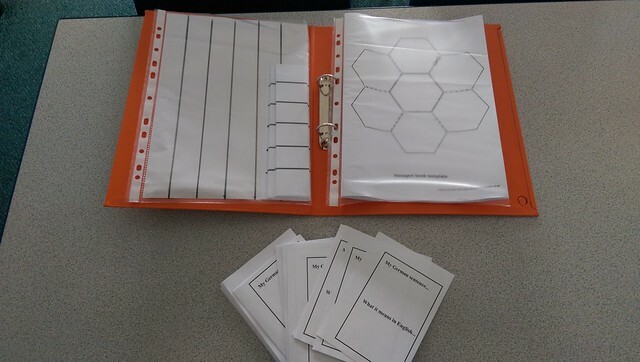 I have a wodge of blank hexagon booklets that students can use in many different ways. This works as an extension task for fast finishers as well as a whole class lifeboat task. It’s a great example of HOTS not MOTS (higher order thinking skills not more of the same) because you can get the students to consider it as a teaching tool. 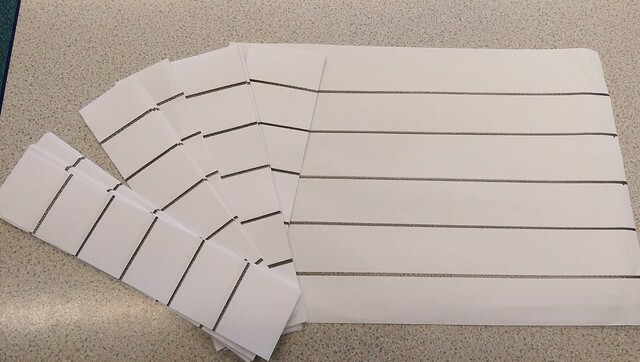 I have some blank sheets for playing strip bingo on, made by simply drawing horizontal lines on a landscape sheet of A4 and guillotining into strips. Students put one vocab item from the a constrained list into each square. You call out the vocab items. Students are only allowed to score the two outside squares of their sheet, so you have to have a way of calling the same vocab item more than once (return the paper to the hat, for example.) If you call the item from the outside of their strip, they tear it off. You have to be strict about keeping the discarded paper safe ready for throwing away and not making a mess with. Students get excited at the name of the game – strip bingo – so I make a point of clearing up that it’s called that because it’s played on a strip, not because anyone will have to remove clothing. It ought to be possible to play this game without providing a preprinted strip for the students, but I find they do not listen to instructions and many do not draw the boxes so they can tear the strip off properly. At least the first few times through, it’s quicker to provide them with a sheet. The same is also true for my final suggestion, aural dominoes. For this, students pick a sentence from their work, which they write in the target language and in English on a small sheet. They then tear the English off, you collect all the English strips, and you get them to pick a new one at random. Then it should be possible for a student to read their TL sentence, another student to hear and understand it, and read the English translation, and then start a chain. Each new student reads aloud the English of the TL sentence they have heard before then giving a new sentence which someone else in the room should have the English for. This can be quite a long activity – up to 20 minutes – until the students are used to how it works and get a bit quicker. What are your go-to lifeboat tasks?